A document management system is an important part of the compliance assurance process but it cannot help a user of or member of the compliance team confirm the quality of a workbook once it is checked out. 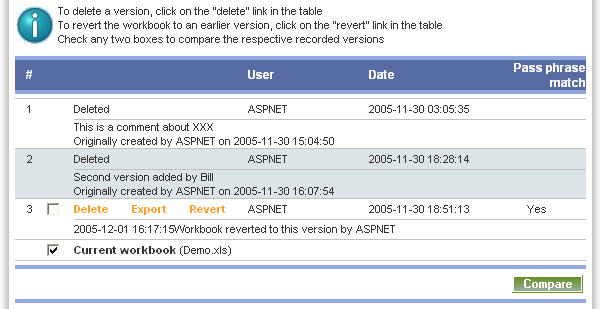 ComplyXL allows for workbooks to be updated to include a saved version of the current workbook. Using either a PC version or one of the web server versions, a user can determine at any time whether or not the workbook has been changed since it was checked out from the document repository. ComplyXL maintains an audit trail, called theVersion History,of versions saved, deleted, exported or rolled back,that can be reviewed at anytime. Built-in comparison tools allow users to visualise the differences between any two versions, for example, a saved version and the current workbook.